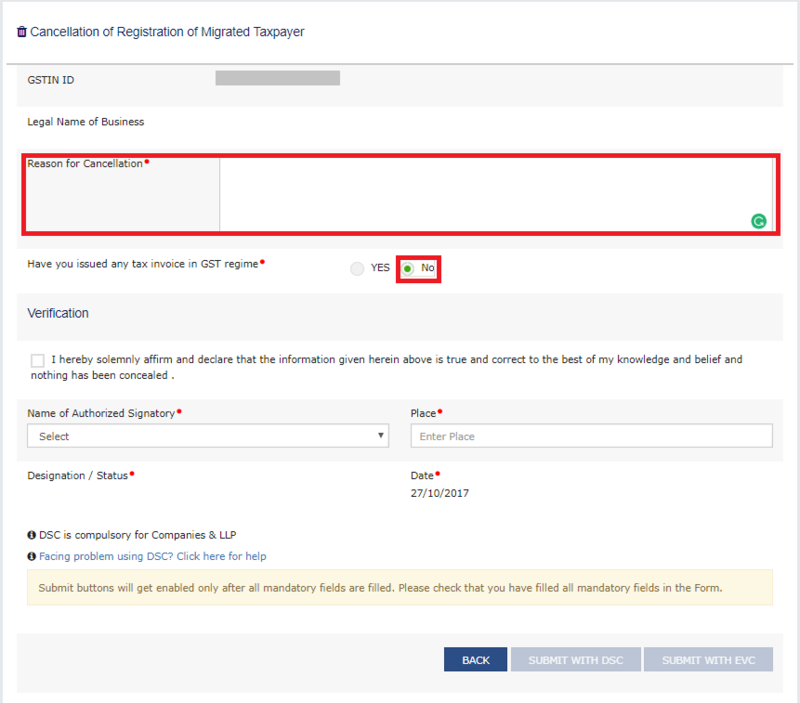 Cancellation of registration under GST- Why & How? 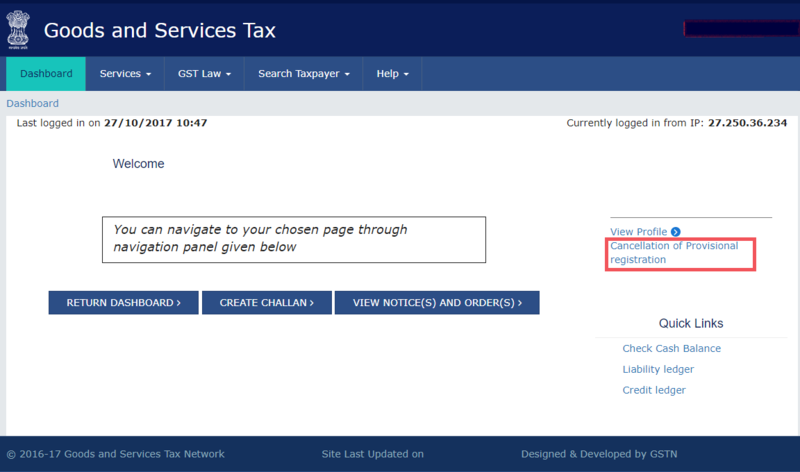 In case you want to cancel your GST registration because GST does not apply to you or because you are shutting down your business or profession. Or there is some other valid reason due to which you want to cancel your GST registration, this article will guide you through the process. What is meant by cancellation of registration? 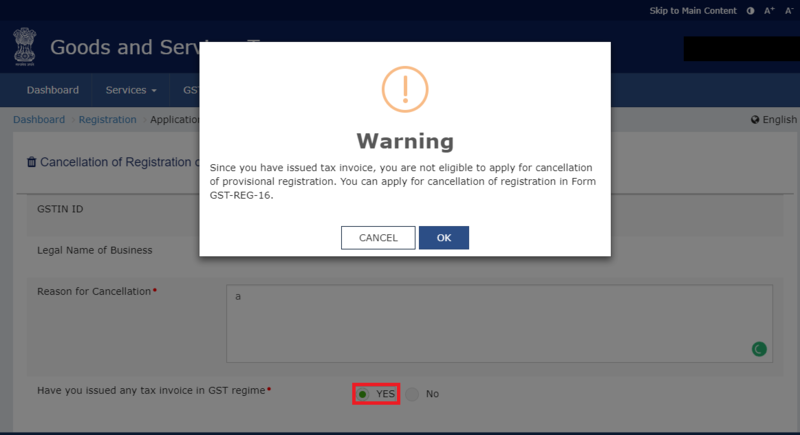 Who can cancel the GST registration? The notification will be effective from 1st April 2019. Cancellation of GST registration simply means that the taxpayer will not be a GST registered person any more. He will not have to pay or collect GST. For certain businesses, registration under GST is mandatory. If the GST registration is cancelled and business is still continued, it will mean an offence under GST and heavy penalties will apply. *** Application for cancellation, in case of voluntary registrations made under GST, can be made only after one year from the date of registration. Let us take up each case. Simply fill up the details of authorized signatories, place. Finally, sign off with EVC with you are a proprietorship or a partnership. LLPs & Companies must mandatorily sign with DSC. Note: Taxpayers who have not issued tax invoice can avail above service. If the taxpayer has issued any tax invoice then FORM GST REG-16 needs to be filed.Refer below. Why does a taxpayer wish to cancel his registration? The business has been transferred fully, amalgamated, demerged or otherwise disposed —The transferee (or the new company from amalgamation/ demerger) has to get registered. The transferor will cancel its registration if it ceases to exist. All those who cannot follow the above method must file an application for cancellation in FORM GST REG 16. The legal heirs of the deceased taxpayer will follow the same procedure as below. Application for cancellation has to be made in FORM GST REG 16. Why will the officer cancel registration? If the proper officer has reasons to cancel the registration of a person then he will send a show cause notice to such person in FORM GST REG-17. The person must reply in FORM REG–18 within 7 days from date of service of notice why his registration should not be cancelled. If the reply is found to be satisfactory, the proper officer will drop the proceedings and pass an order in FORM GST REG –20. If the registration is liable to be cancelled, the proper officer will issue an order in FORM GST REG-19. The order will be sent within 30 days from the date of reply to the show cause. What is revocation of cancellation? Revocation means the official cancellation of a decision or promise. Revocation of cancellation of registration means that the decision to cancel the registration has been reversed and the registration is still valid. When is revocation of cancellation applicable? This is applicable only when the tax officer has cancelled the registration of a taxable person on his own motion. Such taxable person can apply to the officer for revocation of cancellation within thirty days from the date of the cancellation order. A registered person can submit an application for revocation of cancellation, in FORM GST REG-21, if his registration has been cancelled suo moto by the proper officer. He must submit it within 30 days from the date of service of the cancellation order at the Common Portal. If the proper officer is satisfied he can revoke the cancellation of registration by an order in FORM GST REG-22 within 30 days from the date of receipt of the application. Reasons for revocation of cancellation of registration must be recorded in writing. The proper officer can reject the application for revocation by an order in FORM GST REG-05 and communicate the same to the applicant. Before rejecting, the proper officer must issue a show cause notice in FORM GST REG–23 for the applicant to show why the application should not be rejected. The applicant must reply in FORM GST REG-24 within 7 working days from the date of the service of notice. The proper officer will take decision within 30 days from the date of receipt of clarification from the applicant in FORM GST REG-24. Note: Application for revocation cannot be filed if the registration has been cancelled because of the failure to file returns. Such returns must be furnished first along with payment of all dues amounts of tax, interest & penalty. To know more about GST registration and other information, please refer our various articles. To know more about transition to GST, please read our extensive articles on GST .